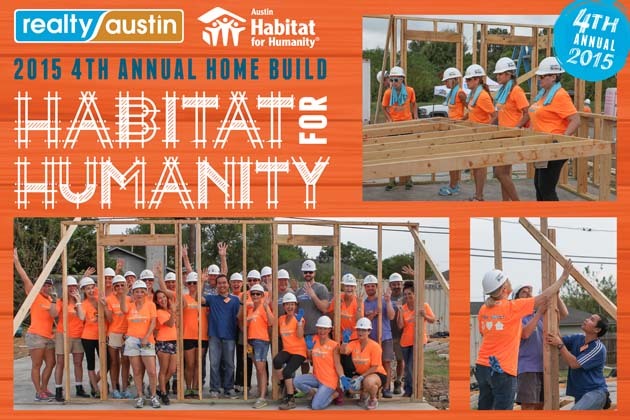 AUSTIN, TX – Realty Austin raised the walls on our 4th annual home build for Austin Habitat for Humanity on the morning of Wednesday, September 9, 2015. Our team kicked off construction by raising the exterior walls of the new home being built for Saw Par Ku and Anna Naw and their two children Serena Naw and Samuel Ku. Over the next three months, 250 volunteers from Austin’s top workplace will work alongside the future homeowners to build their new home. In a partnership with our agents, Realty Austin will volunteer 1,450 hours and donate over $85,000 to sponsor a home for the Ku family. Since 2012, Realty Austin has partnered with Austin Habitat for Humanity to build homes committing more than $290,000 and volunteering over 6,000 hours to improve the lives of four deserving families. Representatives from Austin Habitat and the Realty Austin team were on hand for the groundbreaking and wall raising including some of the company’s top charitable contributors: Jason Taylor, Sarabeth Peterson, Jordan Johnson, Cristina Valdes, Adam Walker, Lisa Munoz, Brandi McDaniel, Mark and France Clausen. The house will be completed in November and dedicated with a celebration on November 14, 2015. To participate in the build, donate online at share.habitat.org/realty-austin-build.